'Unfiltered Sessions' is not a CD that will let your mouth open, nor will it change your way of thinking about music... [it is] simply there to stay as part of your day and source of good mood and energy. Thomas Wolff spend some active years in the 80´s playing with several bands in the Rhinevalley around Remagen /Bonn.Among therm BILLY AKEEM, the TALEWOOD ORCHESTRA and his own quartet CONNECTION. He changed his focus during the 90s and built up his digital production suit CREATIVE-SOUND.de with many publications, most of them under the project name HARMONIC OBSESSION, available on amazon, iTunes and most online shops. (Acid Lounge - RED, Disorder by Night, Embraceable, Per Se, Flute Mood, Chill Out Lounge - Strings, ....) Some of the music (2004-2012) is available as music clips at Youtube. Around 2012 he started again to dedicate more time to live project, which led to his current fave band set PORK PIE HAT. 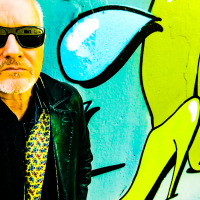 In 2019 Thomas Wolff reactivated his Label CREATIVE- SOUND.de which is distributed by FEIYR.com. His major projects are PORK PIE HAT. (Jazz, Groove oriented Trio) NIGHTSHIFT. (Clubby, Lounge, Chillout - elctronic music with bits of jazzy influences) THOMAS WOLFF (several Guitar oriented works, solo and with guest musicians) While his style changed over the years to be less spheric, yet sometimes rough and straight in the face, the below review of his works for HARMONIC OBSESSION still takes the biscuit. A review of some early works of Thomas Wolff (Harmonic Obsession /PER SE´, EMRACEABLE ME) by Press reviews mp3.com/integrated arts IV Excerpt find some tracks that I simply must have on my hard drive .Speaking of which, here´s one.Incredibly bright, contemplative music here, traversing a path before taken by Tangerine Dream and quite possibly the YellowJackets in the Jazz vein. Highly recommended for those who still believe meditation is possible in any genre or format, as long as it is presented correctly. Originating from what looks like a MIDI dream studio, the musical masterpieces from Harmonic Obsession promote that aesthetic: Pure, unadulterated (though highly processed) Pat Metheny, Ozric Tentacles (stabilized), King Crimson, Miles Davis, Jaco Pastorius, Special EFX, Philharmonie, and Brian Eno influential jazz, all seemingly pressed into a sterilized, yet far from homogenous state. Thomas Wolff spearheads Harmonic Obsession, the true course of his vehicle known only to him. Each track bursts with highly concentrated analog and digital sound bombs that explode ruthlessly around the teeming listener, yet the smoke pluming from these sound bombs have the most intoxicating gas known to man: ether. If we were to apply the impeccable guitar and synth melodies and leads simply plastering HO's tracks to the carriage of dreamy sleep known as ether, we would come up with a fine representation of that gas and it's inherent properties. And finally, the most important thing. Unfiltered Sessions is not a CD that will let your mouth open, nor will it change your way of thinking about music. Unfiltered Sessions is simply there to stay as part of your day and as source of good mood and enrgy. All About Jazz musician pages are maintained by musicians, publicists and trusted members like you. Interested? Tell us why you would like to improve the Thomas Wolff musician page.